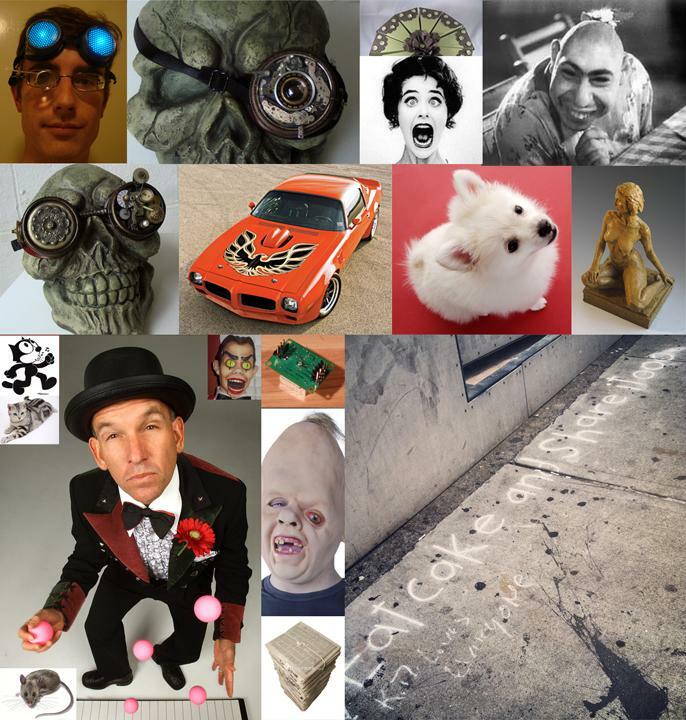 This gallery only contains our top 20 selections from its parent contest Freak Show. All 21 contest pictures can be viewed here. Impressive work, but way too dark perhaps? Of crap, i'm photoshopping on a very big screen now, Like more than a yard, and when i look at the large view on this screen it looks really great, but on the smaller view it looks too dark. I guess when you look at it on an avarage size screen it becomes too small and it loses itselve in the darkness. I really expected good reviews on this one... ... Oh well, you all should buy a big tv and look at it on that! Hidden: try laying a (White over Black) Gradient Map copy, set to overlay on top of your picture. I tried this with your picture and it looked amazing. To get white over black map tick the reverse box in the gradient map dialog box. Use 2 maps and adjust the opacity if one map doesn't brighten enough. I thought 1 map did just fine though. Great work! I tried curves, not sure if Its improved. Really Good !!! Hey, thanks guys! Splatshot, i work with paint shop pro, and i can't find the reverse box or the gradient map dialog box. I tried crusaders tip(thanks for that!) and did something with curves. Does yours look better? I didn't save my copy, so I don't have anything to compare it to. And yes, this does look better. Dark or light, your chop is FANTASTIC! Love it!!!!! 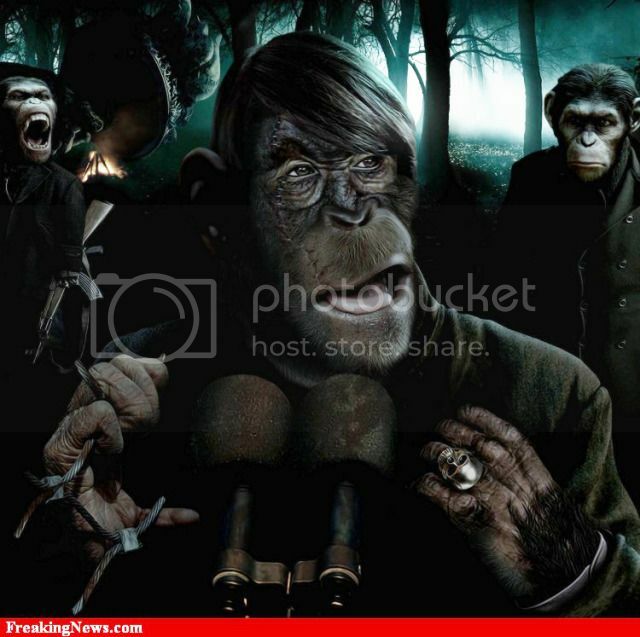 A dictator of Apes!!! great chop done using all the sources. Me thinks the edit looks amazing! Thanks for the help and the compliments guys! Great stuff jeremix! Congrats on the gold! Gold Congrats jeremix, great work! … My only critique would be with the composition, specifically the section to the left of the central figure … I find it to be somewhat cluttered and distracting, and the ape holding the weapon has such a short arm, especially for an ape? Also, the stark contrast in resolution quality between the central figure and the microphones was the 1st thing I noticed. Great job! I love the funky perspective you used. Is that Newsmaster in the paper? What he do this time? For some reason this chop really caught my eye. Thank you SplatShot, Thank you balodiya, and many Thanks to you rajeshstar … you are the King of Comments! Grats on winning silver, G! Still not sure about the eyes, but a great chop nontheless. Especially the dog! Luv the perspective Qt! Grats on the silver! TONS of work and skills in this freak chop! Thank you kindly everyone … much appreciated! Nice work! The blade should go behind the wheel though. Grats on winning bronze, F! I thought i recognised that attic from the planking grandma. Congratulations. Never disappointed with your imaginative powers. Amazing stuff - it feels like I can hear spooky wind just looking at this entry! Great stuff, funk … always a treat! Congrats on the Bronze! Awesome wood chop! Grats on the woody! I knew this would win at least WOOD! Really like this chop, lucido … great work, congrats! Great illustration work, PixJockey, very professional looking … a lot of great chops in this one! Fairy tales come to life! Excellent! Is she flying the copter by remote? The bear is the perfect touch!!! Superb! Excellent whether condition shown liked it. Very cool QA … congrats on the theme post! rajesh, you probably just missed it, I'll have to send you a schedule as to when the square/cube comes out.